This list includes our candidates for the best parallax WordPress themes available to web developers and designers at this time. We’ve used quite a few of these themes at one time or another when working with clients, so this list comes from experience. Parallax describes the visual difference in position between two objects viewed along two lines of sight. Think early console games where the background layers moved through the viewport at different speeds, creating a three-dimensional feel to gameplay. The term is derived from the Greek παράλλαξις (parallaxis), meaning “alteration”. Web designers and developers have adopted a variety of parallax effects to bring motion and depth to their designs. Common effects you will see in this roundup are background images that move faster or more slowly than the content positioned above it, objects that move across a field as the page scrolls, and multiple backgrounds with transparency that shift across one another at different speeds creating depth. 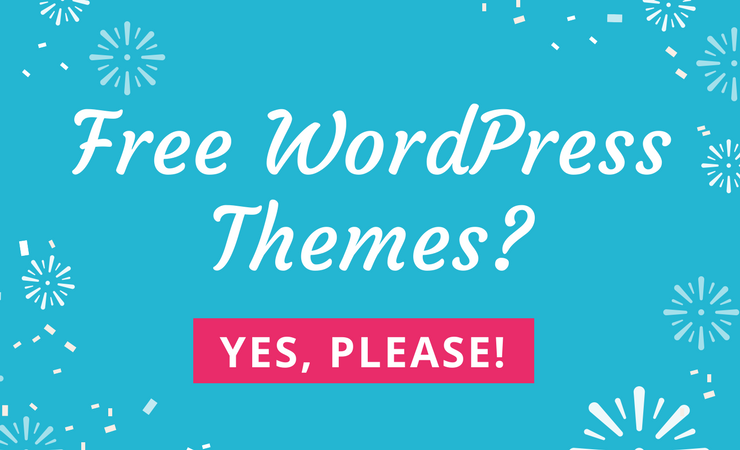 Are there themes you’ve encountered that we need to include on this list? If so, drop us a line in the comments and we’ll review and post. As with all great parallax WordPress themes, the Simpleshift solution has more than one area to implement the beauty of the parallax effect. The header module takes up the majority of the screen, and you can insert a beautiful image that spans the entire width of the page. This image is then placed into a parallax effect, so when the users scroll down it moves just a little bit slower than the rest of the page. As we discussed earlier, parallax features are known to keep your site speeds fast while also adding a little creativity to the mix. Many websites used to have complex animations, but those were a pain when it came to the user experience. This parallax header also provides text and buttons, both of which can be edited for your own personal use. For example, if you’d like to tell users that you’re running a photography blog, place it right in the header. If you want them to click on a button to buy some of your pieces, change the text of that button. The parallax header is not the only area where you’ll find this effect. In fact, several rows below the header use parallax backgrounds. For example, you can place your testimonials right on top of a parallax image, or maybe you want to include another call to action button further down the screen. This is one of the more customizable parallax themes, but if you don’t want to put in much work, most of the rows are pre-built. 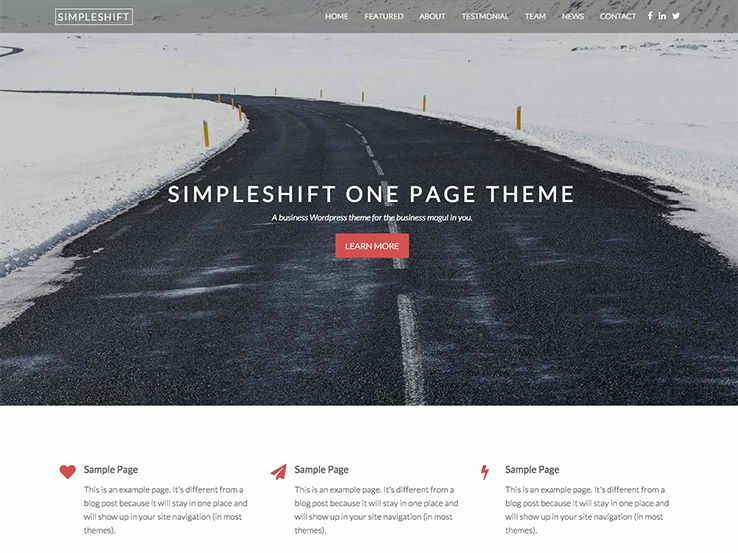 The Simpleshift WordPress theme is a one-page theme, allowing you to insert a wide variety of rows with content for social media buttons, recent posts and more. For example, the “Meet the Team” row has images and social media links, showing information about the people who work behind the scenes, while also combining well with the parallax effects, since this is truly a visual theme. If you go to the theme demo, you’ll notice a really cool use of the parallax background. Scroll down to the bottom where you will see the contact form right on top of one of these parallax rows. 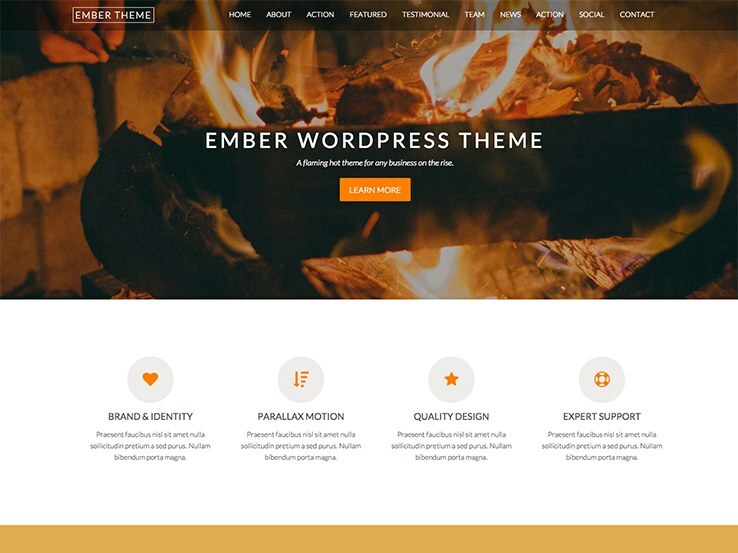 Check out the Ember WordPress theme if you’re interested in a strong one-page theme with a beautiful parallax header. It’s an immediate attention grabber and it allows you to quickly point the visitors to the most important section on your website. As with most parallax themes, this one loads quickly and still looks nice on mobile devices. The ability to add a paragraph or two with a button is perfect for including a call to action. Use it to send visitors to your landing page or a sales page or promote your latest blog posts. Customize the button on the backend to create an eye-catching call to action that stands out from the rest of the page. The custom CSS is your friend if you’re interested in making more advanced changes. The entire homepage includes plenty of sections for all the important information. Some of these sections provide parallax backgrounds, adding an interesting dynamic to your website. If you’d like to develop more of a landing page, the parallax sections are great places to include call-to-actions to increase click-through rates. Moving on from the parallax features, the Ember WordPress theme offers a recent posts widget, which is great for promoting your latest posts. There is also a team members section which allows you to feature your coworkers or partners. Social media buttons are included so you can easily grow your social media following. Overall, the parallax features are smooth, and they combine nicely with the modern and simple one-page design. Lara theme is a recent release from Nimbus Themes and has become a favorite among our devoted theme users. It offers beautiful styling, feature-rich functionality, and almost unparalleled flexibility. Whether you’re building a small business website or a high activity blog, Lara is the perfect fit! This is a one-page theme and this always goes well with the parallax features. The homepage features a large parallax header along with various other sections where you can implement interesting styling. The header area has overlaying buttons and text which is perfect for adding your tagline and directing visitors to other sections of the homepage. Several other animations and movements are featured throughout the Lara theme, and this is noticeable in the portfolio/gallery modules, adding creativity to the theme. The blog looks rather stunning since most of the content is surrounded by white space, allowing you to put the focus on your writing. Six blog layouts provide variety when people scroll through the site and allow you to share tips with your audience, which is sure to increase your search engine rankings. 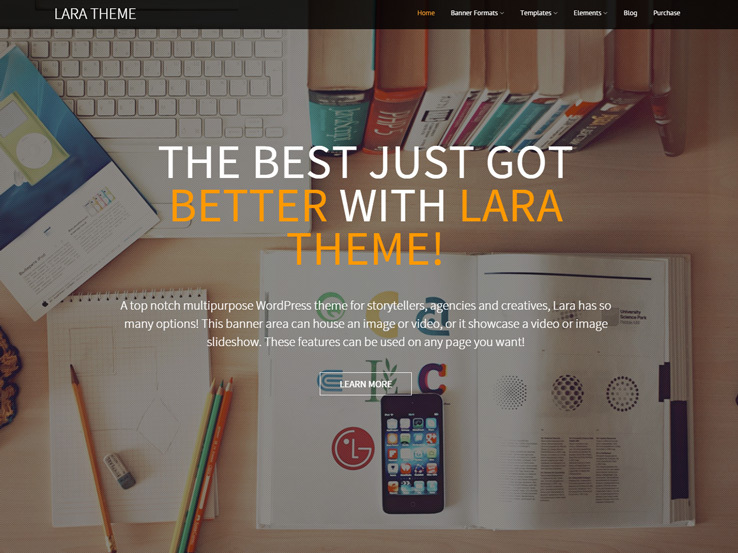 Overall, the Lara theme is a nice choice for any business or corporation, as it includes a wide set of features such as shortcodes, testimonials, and more. The Venture WordPress theme presents a beautiful parallax layout and this entire parallax header takes up the majority of the top screen, with the logo and menu sitting on top of that. The black navigational bar puts quite a bit of focus on your menu without detracting from the rest of the design. This isn’t the only parallax area, considering the one-page theme has several parallax modules as you scroll down the page. 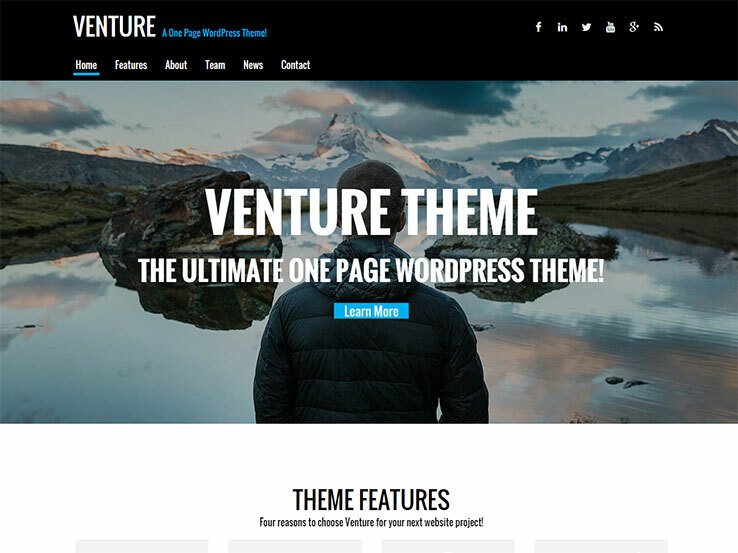 As with many one-page WordPress themes, the Venture theme provides spots to feature information about your business. For example, a “Meet the Team” section allows for images and details about your coworkers. There’s also a module that creates several large boxes that show some of your recent articles. In addition to the parallax designs scattered throughout the entire page, you can also place this behind the contact form, adding some creativity to the area that most people find boring. The entire parallax layout looks great on mobile devices, meaning that the animations don’t look distorted when brought up on a tablet or phone. In terms of parallax features, these are wonderful ways to build your brand identity and the Venture theme has additional features to give you everything you need for a successful online presence. As the name implies, the Simple Theme offers all the quality and flexibility that you’ve come to expect from Nimbus Themes in a new, modern, minimal, clean design. The navigation bar can be placed above or below the parallax header and it can be set to appear fixed. The parallax image area provides support for large, high-resolution photos and it can even include text overlays and buttons. It’s a handy way to send people to other pages or to explain what your company does. 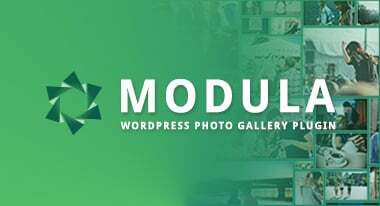 Choose which modules you’d like to show on the one-page website, with sections like team profiles, testimonials, and social media buttons. You can alternate between having parallax animations or static images in each of these sections. The social media section is great because the buttons are much larger than the ones you would see in widget form in a sidebar. 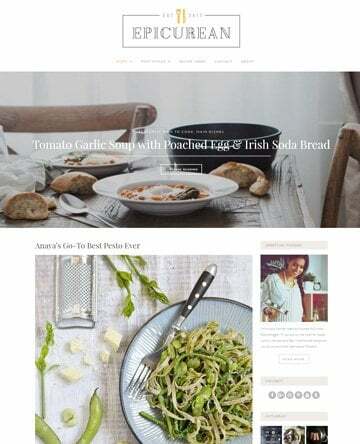 In addition to the parallax design, the theme includes tons of homepage layouts such as a blog feed and featured pages. The theme is fully responsive and the fully loaded options panel gives you the tools to add shortcodes and customize fonts and colors. Use the shortcodes to add different design elements such as buttons without having to touch any code. 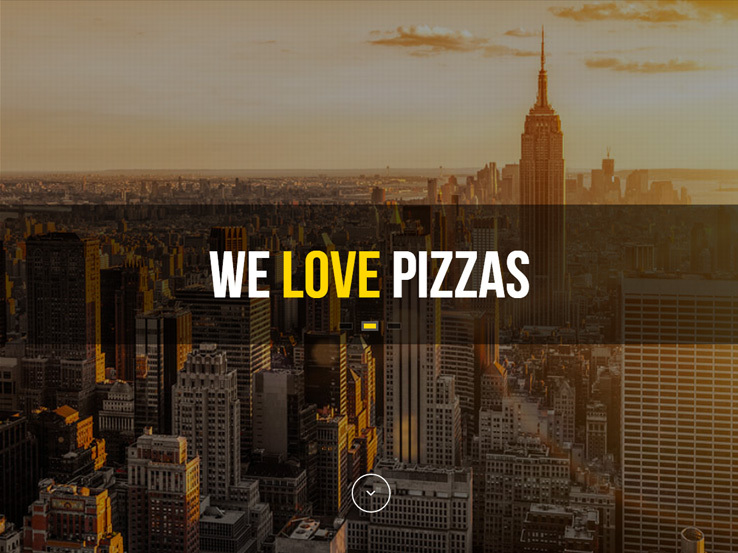 Zerif Pro is a perfect example of the parallax effect combined with a modern row-based layout. 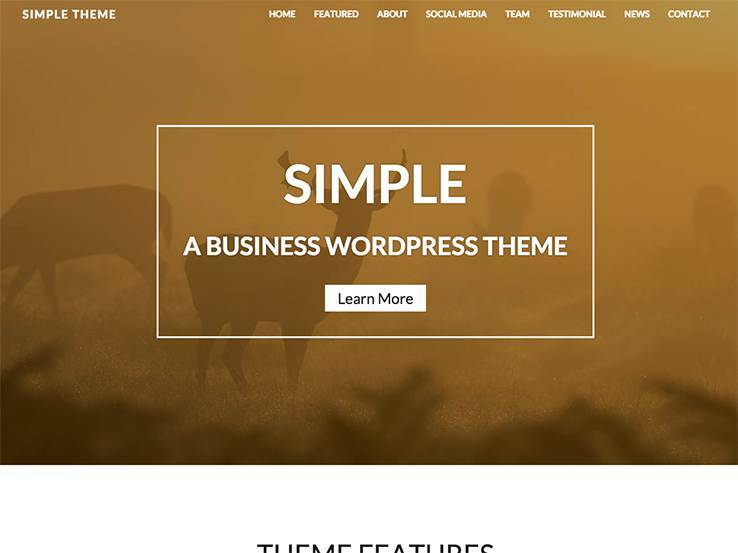 The outcome is a beautiful and highly functional WordPress theme that offers amazing potential for businesses of all kinds. In addition to, and sometimes in combination with, the parallax features you’ll find a smoothly flowing slideshow with a horizontal motion effect. 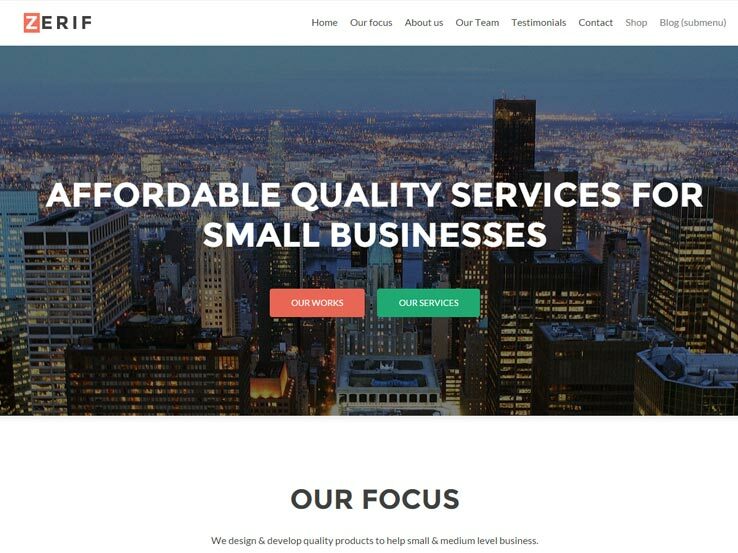 Zerif is one of the overall best theme options for small businesses in 2015 and should not be missed in your search for the right website template. RokoPhoto combines a beautiful mix of text and image layouts with flowing parallax effects to create one of the most interesting themes available. 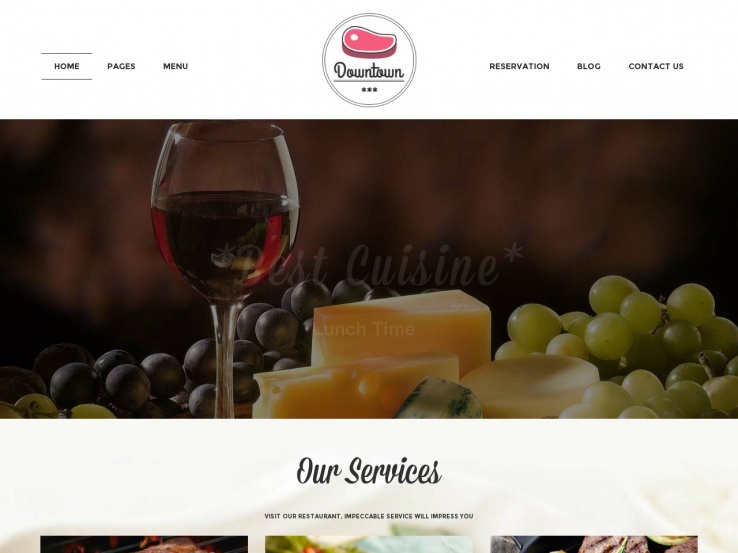 The theme is fully responsive and ships with a powerful theme options panel providing unlimited color, typography and layout combinations to choose from. The RokoPhoto design includes a beautiful portfolio layout integrated onto the frontpage, minimal and clean blog, and a fabulous fullscreen slideshow. 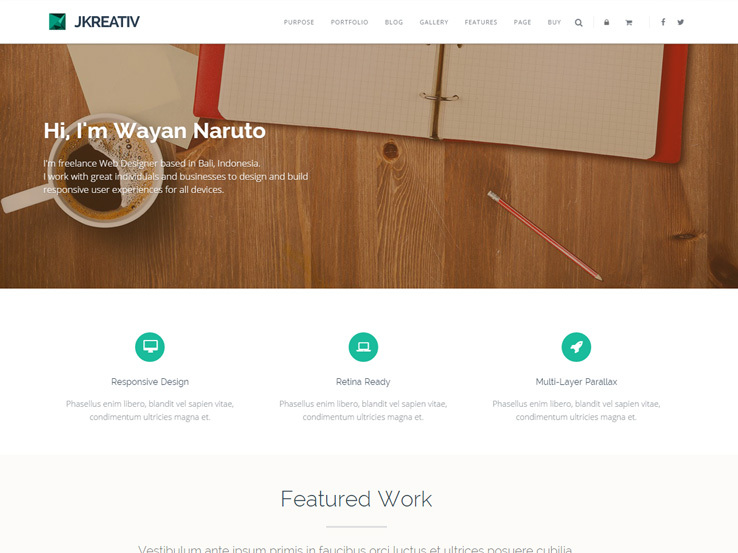 The OnePage WordPress theme offers a creative design, for the ultimate one page experience. The drag-and-drop homepage is ideal for anyone who doesn’t have any experience with coding. Not to mention the parallax header grabs attention right off the bat. Feel free to disable or enable any section on the site and use the portfolio post type to show off your most impressive past jobs. The responsive design looks wonderful on all smartphones and tablets and you have a chance to display tons of information about your company. Use the stats module or consider showing a feed of your Twitter page. Many companies opt for a pricing table while others want to reveal customer testimonials. 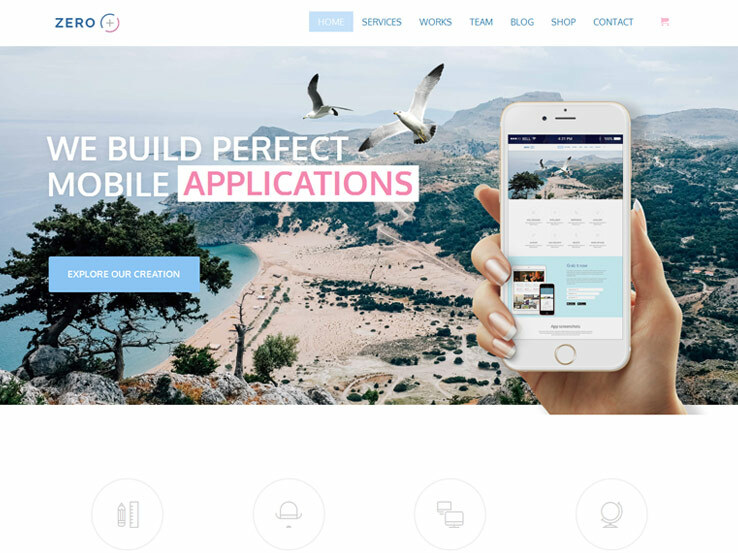 The CleanApp theme is another viable solution if you’re looking for a modern parallax theme since it provides a full-width header and a few other background components on the homepage that use the parallax effect. The theme works on any mobile device and the scrolling effects are some of the best on this list. Use the testimonials features to build trust with potential clients. The theme comes packaged with Google Maps integration and a nice contact form. The one-click demo installation plays into the theme’s ease of use, and you can always translate the theme contents to allow you to expand your business globally. 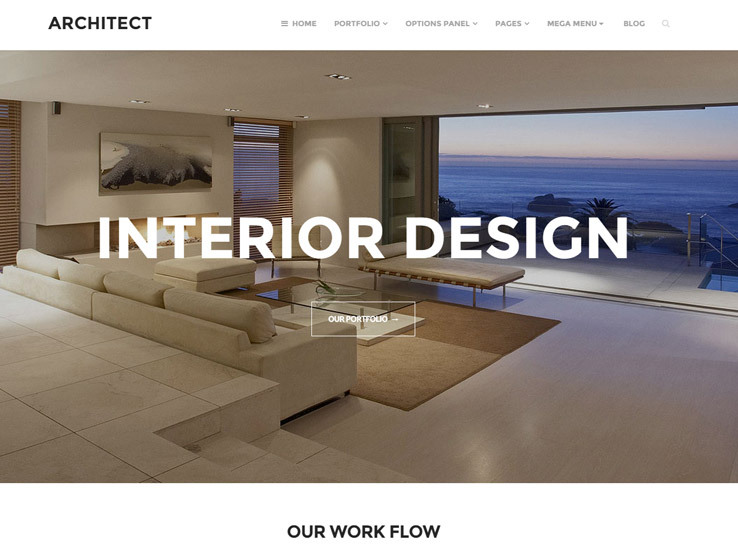 The Architect theme is designed for construction and architecture firms and it features a stunning parallax effect which allows you to showcase your portfolio in an elegant way. The thoughtful design includes responsiveness for all mobile devices and a portfolio post type for outlining the works you are most proud of. Use the drag-and-drop homepage section to build your website and consider implementing the Google Maps feature onto your site so that customers can find your business without any problems. The contact form is a bonus and you can always include a custom counter for displaying interesting facts about your company. 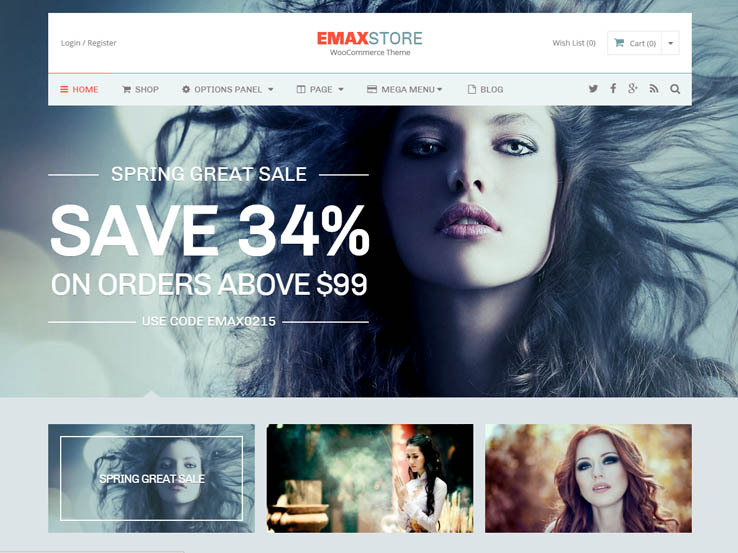 The eMaxStore theme is a wonderful choice if you want a theme that supports eCommerce and has a parallax effect included. This gem works with WooCommerce, so you can sell anything from digital to physical products. The fluid responsiveness ensures that your website will look great on any device. The retina font icons display beautifully on high-resolution screens of all sizes and the check-out process is easy to follow so you can rest assured your conversion rates won’t suffer. Thanks to this, your customers will be more than happy to return to your site. 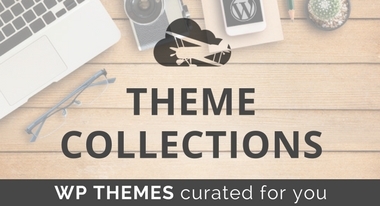 Along with unlimited categories, footer column sections, unique product slider widgets, and a related product carousel, you can’t go wrong with this theme. 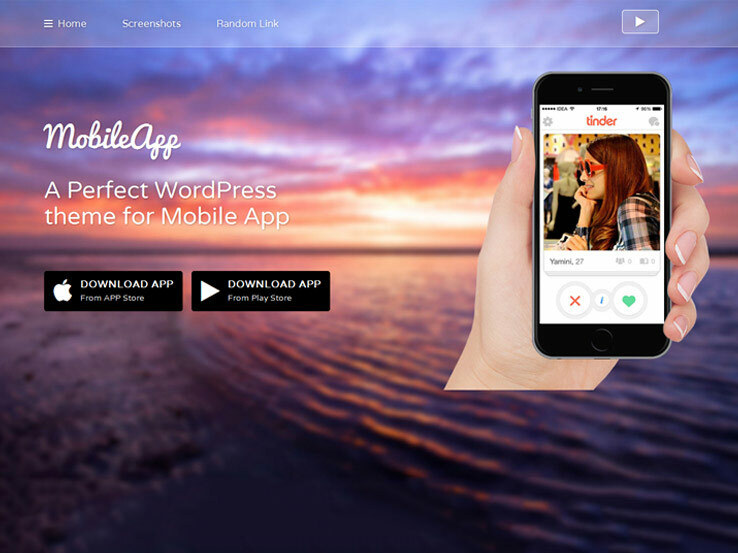 Go for the MobileApp WordPress theme if you plan on selling a mobile app to prospective users online. 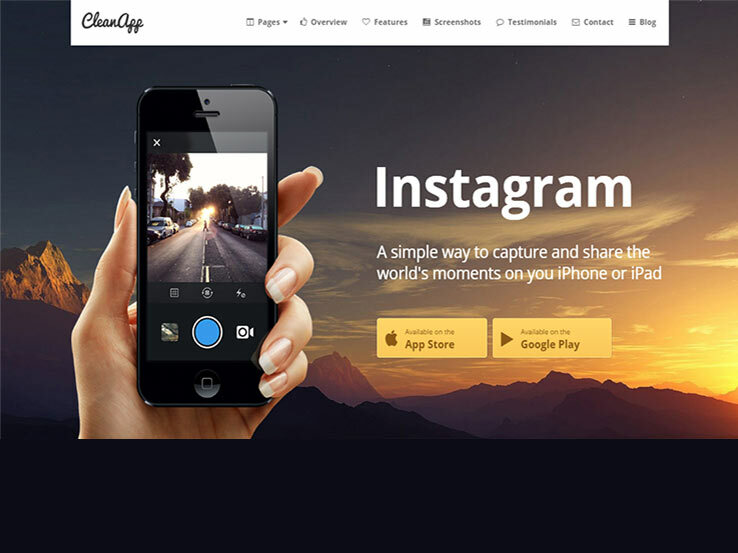 This creates an intriguing app website with parallax components on the homepage and throughout the site. Not only that, but the theme has unlimited sections along with animated screenshots for your homepage. Your purchase includes six graphics of different mobile device screens to place the screenshots of your own app on devices like Androids, Windows phones, and iPhones. 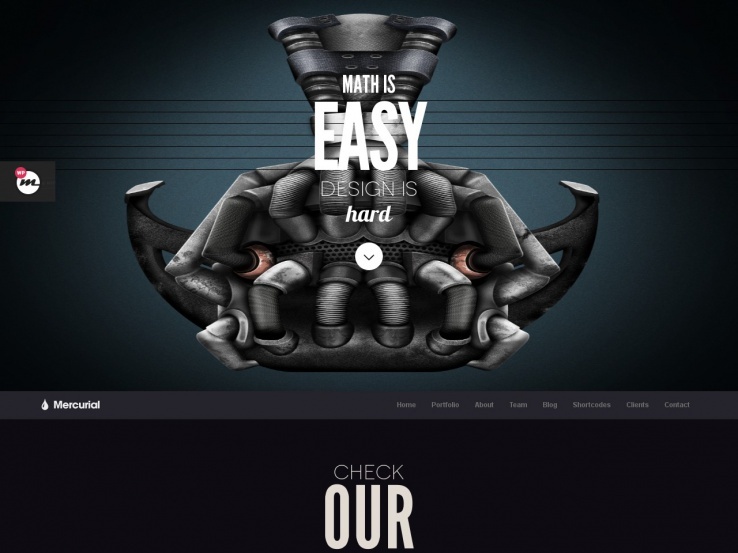 The sleek, animated text effects only add to the parallax movements. Keep in mind that the theme also comes packaged with a contact form, meaning you won’t have to install an additional plugin. This keeps your website light while also helping you connect with your customers. 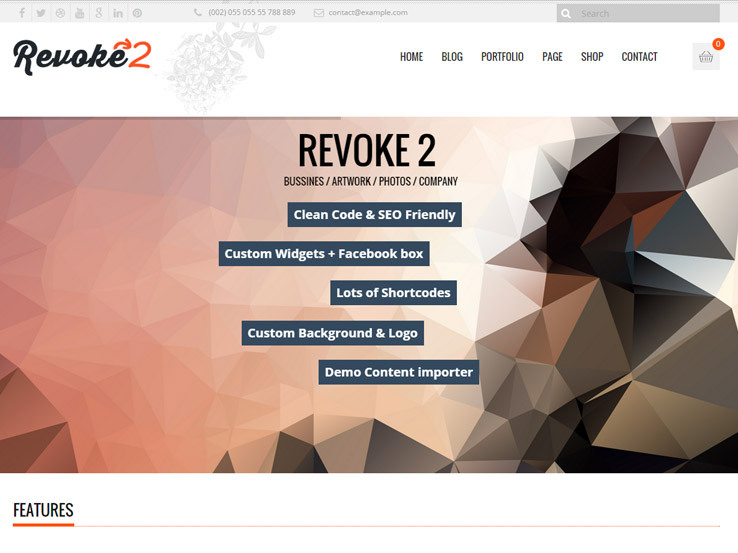 Revoke2 is a parallax theme with lots of nice features. It can display a full-width layout. It includes a full-screen Revolution slider that allows you to add animations and unlimited slides. It’s eCommerce and translation ready and has six custom post types that include Portfolio, Services, Testimonials, Features, Team, and Partners. It also has several custom widgets that include a Facebook box. It has clean code and is optimized for SEO and is responsive so it looks great on any device or screen. You can customize it easily, as there are three customizable sidebars and you can use a custom background and logo. It’s built on the Tesla Framework so you can customize it easily without having a deep knowledge of website programming. The tiled post system looks great, making this a sharp website for business or blogging. 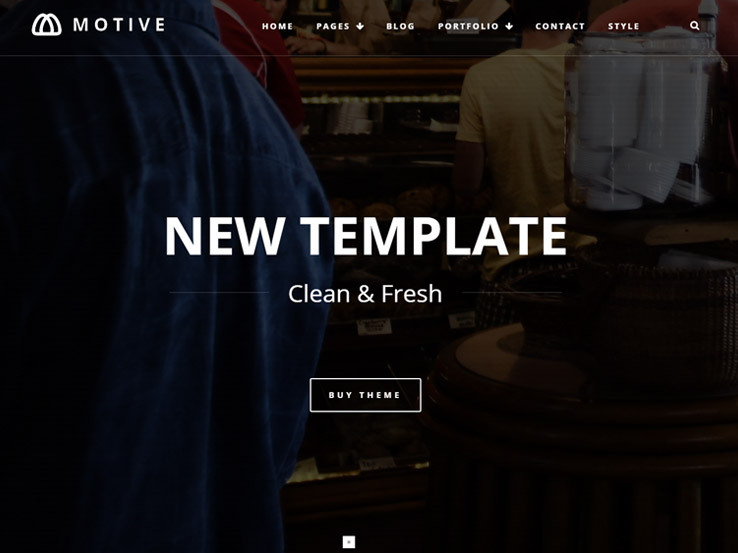 Motive is a clean and fresh design with lots of layout options and beautiful animations that make any website look stellar. There are three different portfolio styles so you can display your content in a grid (with 2, 3, or 4 columns), mosaic, or masonry layout. There are two different styles to choose from and both look clean and elegant. You can customize the sidebar position. The three-tier menu structure is always accessible so your visitors can get to your content quickly and easily, and the parallax scroll effect is pleasing to the eye and highlights your content and backgrounds. 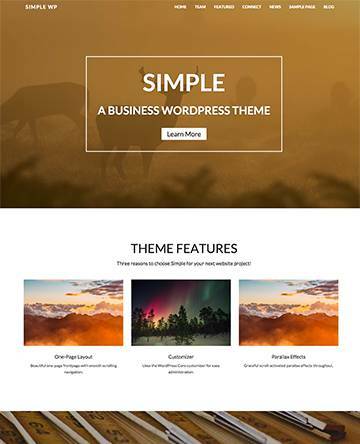 This theme includes lots of features to make your website stand out, such as parallax backgrounds, the Revolution Slider, sticky navigation, icons, post formats, a form builder, custom posts, custom widgets, shortcodes, and lots more. It has animated counters that add some serious sparkle, social media buttons, accordion, Flickr Images, and more. It’s built on the Tesla Framework and is fully customizable. 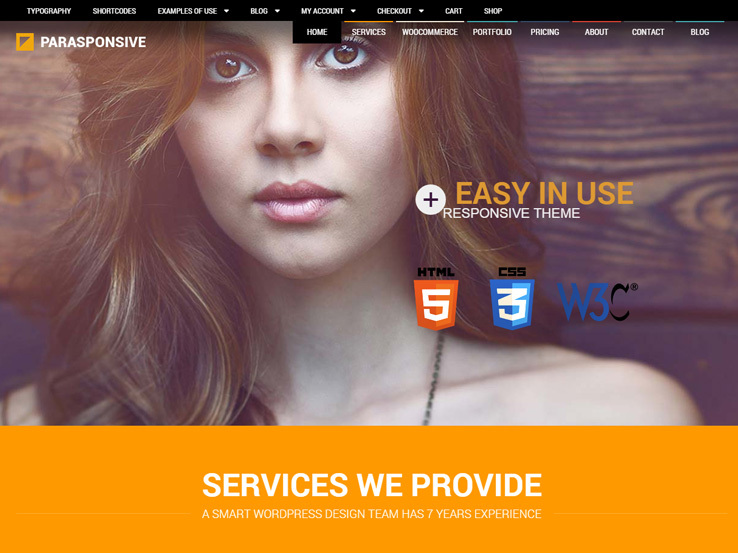 It’s built with clean HTML5 and CSS3 code, is 100% responsive, and optimized for SEO. This is a fine choice for a blog, portfolio, design agency or other online business. The Unik WordPress theme comes from Tesla Themes and it provides some beautiful parallax elements throughout the entire theme. The slider is a wonderful way to highlight information about your upcoming promotions and events. If you’d like to share details or images, simply upload them to the slider and add it to your homepage. 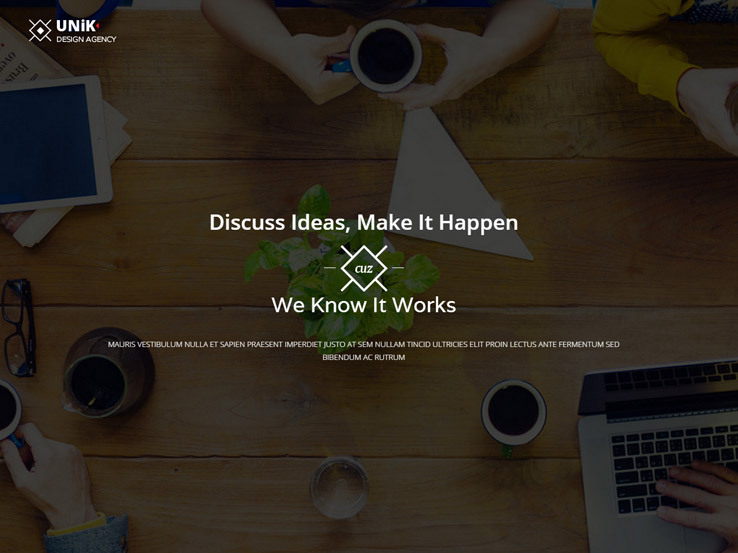 This is a great corporate theme with a portfolio area on the homepage, enabling digital media firms to highlight their past work and organize it in a professional format. People can click on the items for more information or even filter based on certain categories. 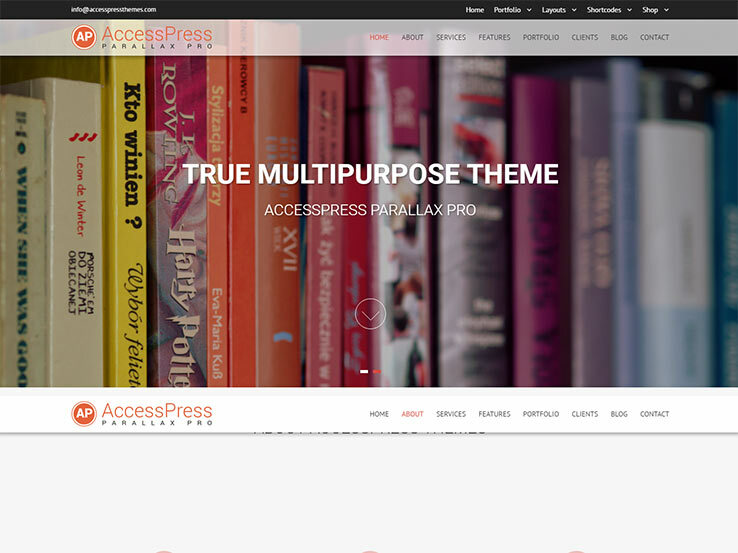 This theme can be set to display as a one-page theme since most of the content is combined on the homepage. However, you also get a full blog, which allows for lots of posts that build your SEO and allow you to connect with your audience. Feature logos of past clients and share their testimonials about your work. When it comes to fitting lots of content onto your homepage, the Unik theme has you covered. In fact, the footer area is ripe for placing widgets, with options for recent posts, social media buttons, contact information, and email subscription forms. The shortcodes are great for organizing your portfolio and even making simple buttons. Overall, if you’re looking for a sleek theme with plenty of backend features, the Unik theme is a great choice. 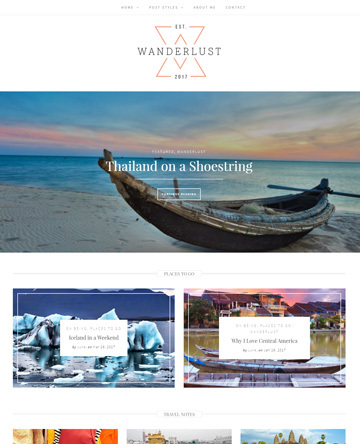 The Downtown WordPress theme is a viable solution for those interested in a beautiful parallax layout. It’s developed by Tesla Themes and it is primarily designed for restaurants. This is a completely responsive theme. You can include parallax backgrounds throughout your theme and not just the area specified in the demo. The header module features a navigation menu and a slider for showcasing your signature dishes. In fact, the slider is powered by the Slider Revolution plugin, which is one of the most beautiful plugins you can find. Customization is handled on the backend since the theme uses a wide range of settings and options on the WordPress dashboard. You can change logos and backgrounds with the click of a button and the custom contact icons are great for adding visual appeal to your contact form. The social settings allow you to display custom sharing buttons as well as links to your social media profiles. Use custom widgets and posts to create areas for services, portfolios, testimonials, and more. Team members can be featured and the calendar is there in case you’d like to feature events. Several built-in shortcodes keep your hands away from the code and the AJAX contact form doesn’t slow down your website. This helps with your SEO and makes it easier for people to contact you. Overall, the Downtown theme is a great choice for companies that want parallax rows on their homepage. Check out the Zero WordPress theme if you’re interested in a responsive and sleek-looking theme with parallax sections to make a lasting impression on your visitors. The demo doesn’t really show many of the parallax features, but you can implement them along with background images to create a parallax effect. Plenty of other features are packed into the Zero theme as well. For example, you can connect the Zero theme to WooCommerce, which is a convenient plugin for setting up an online store. Showcase your items and connect with a payment processor to collect payments. The portfolio has handy filters and thumbnails so potential clients can get more information and the blog has what you need to share tips with your audience and boost your search engine rankings. Two premium plugins are included with the Zero theme. The first is the Revolution Slider, which has animations, overlaying text, and many other features to create a stunning slideshow. The next plugin is the Visual Composer, which has a drag-and-drop interface that allows you to add various content blocks to any of your pages without touching a single line of code. The Tesla Framework offers support for one page or multiple page websites and it includes vector icons that are wonderful for giving your website a more visual touch. The typography is a bonus, and the visual color picker ensures that your branding is always on point. Along with three custom widgets and various other tools, Zero is one theme you shouldn’t ignore. 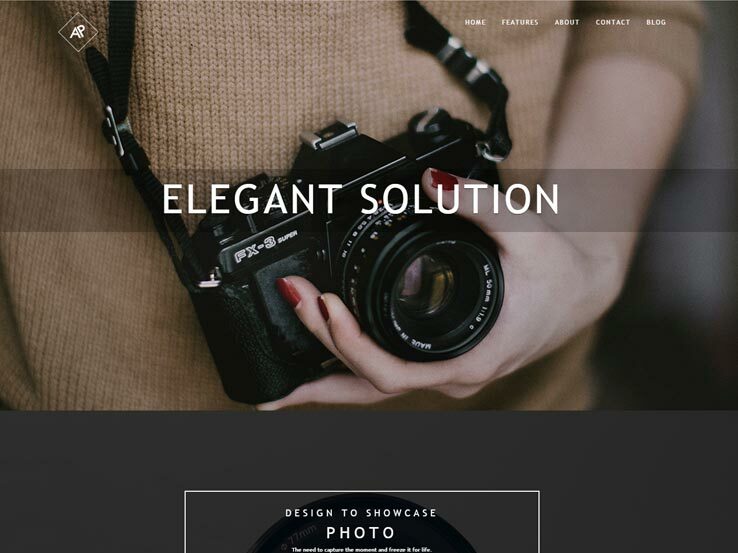 The Parallax Pro theme puts most of the focus on the parallax effect as the beautiful design is made to improve conversions and create a great first impression on your website visitors. Several features are packaged into the theme. You can have a full Google Map embedded onto one of your pages so you can easily display the location of your business. The single click installation feature is ideal for launching your website quickly while the responsive nature of the theme is great for people who are looking at your website from a mobile device. 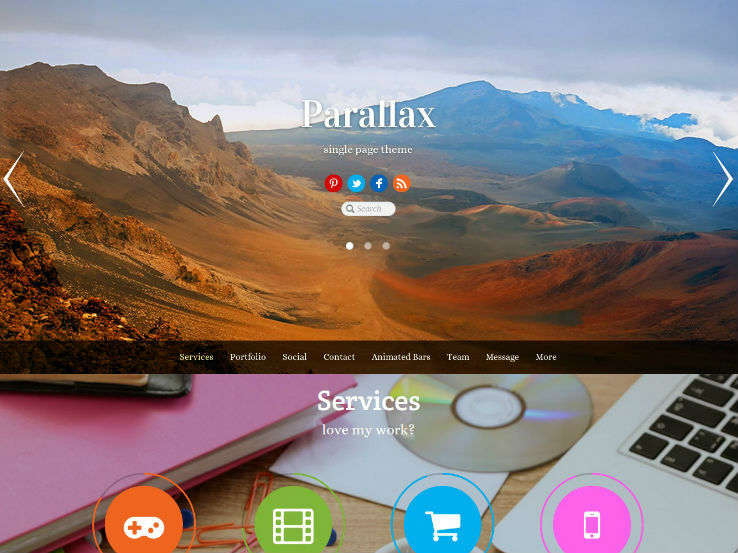 The Parallax Pro theme is a multipurpose theme so you can use it for travel, health, portfolio websites, and more. 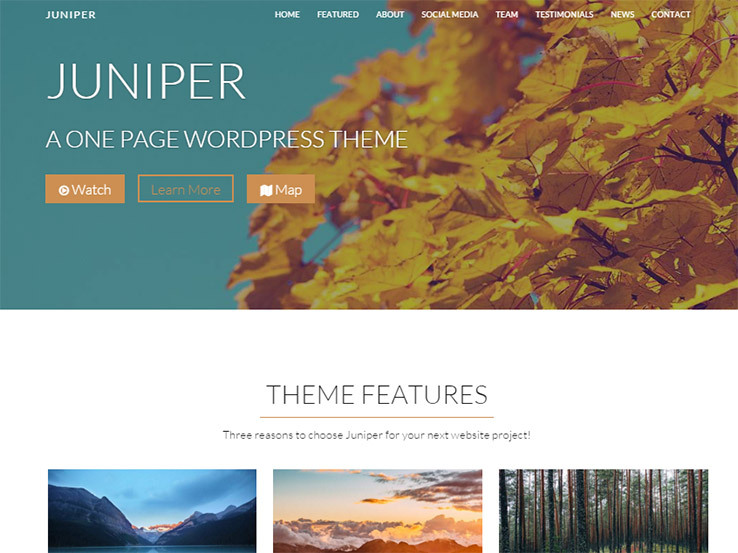 The theme also includes a page builder which means you don’t have to modify any code. The theme has plenty of widgets to customize your homepage and your sidebars. The slider is great for uploading images with overlaying text and buttons to serve as call to actions. Several shortcodes help you add elements like buttons and columns while the translation files provide an easy to way to translate your website. Overall, this is one of the more functional parallax themes on the market, so give it a try to see if it works for your business today. 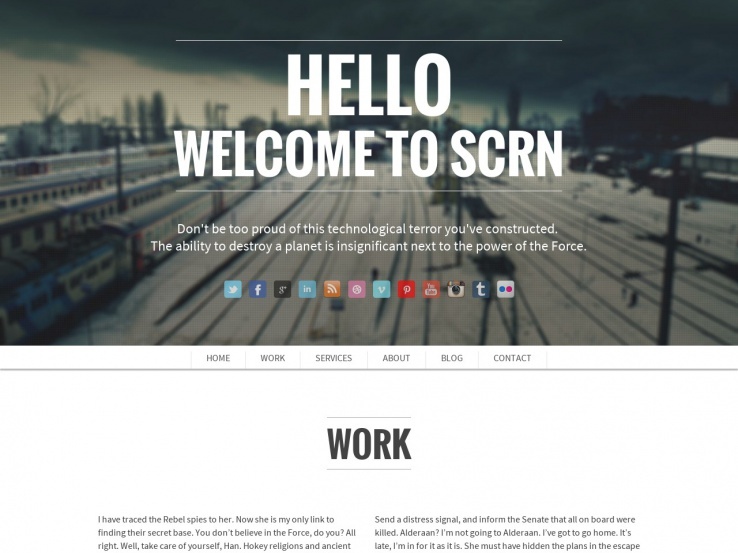 SCRN is a beautiful parallax, one-page, responsive WordPress theme designed for any type of business website. The author guarantees compatibility with all modern browsers and mobile devices, and the design utilizes the popular row-based format. With a high-impact, full-screen frontpage slider, the Parallax theme from Themify is a powerful platform upon which to build your portfolio or agency website. 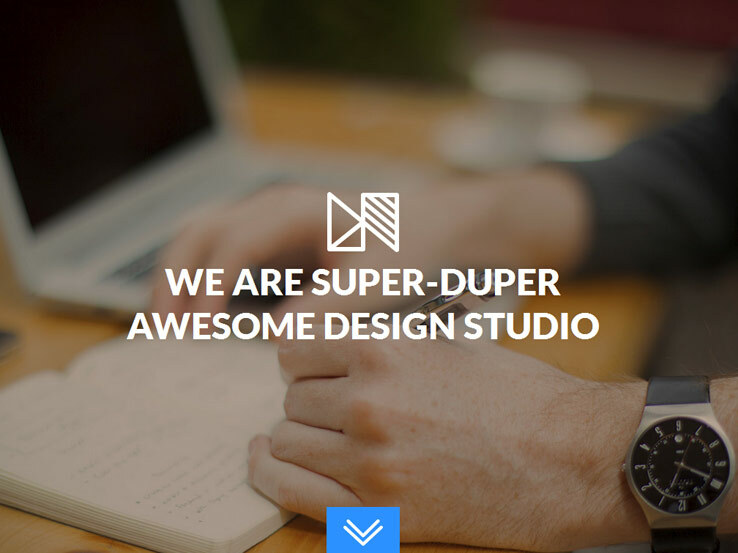 Mercurial is a fully customizable, parallax, one-page, responsive WordPress theme that would be perfect for freelancers, artists, studios or even a product landing page with some modification. 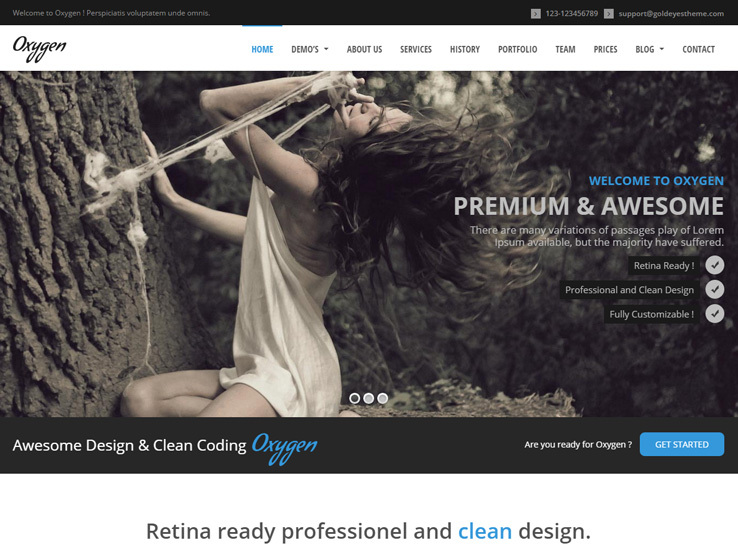 The theme is Retina-ready, has a suite of shortcodes, and combines smooth scrolling with lovely parallax effects. 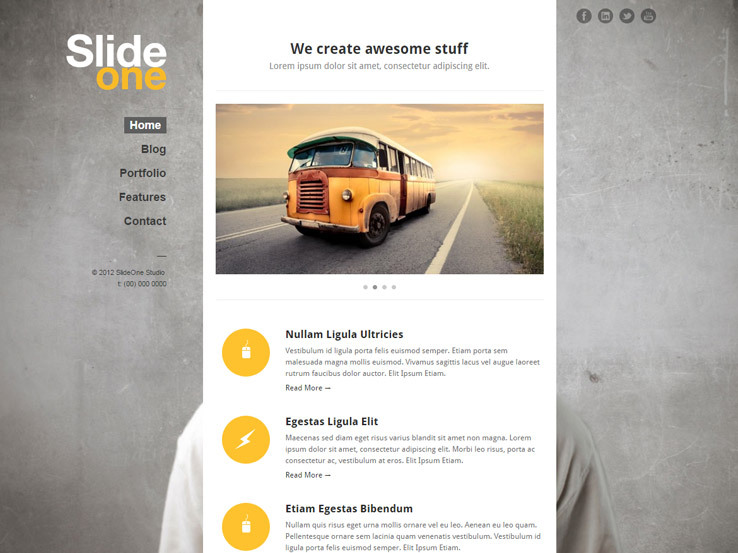 Slide One is a streamlined, one-page theme with a high-impact parallax background effect. You’re also given an extensive theme options panel to work with including logos, fonts, social media icons, and backgrounds. The theme is fully translation-ready and now offers an easy to work with Page Builder admin panel. 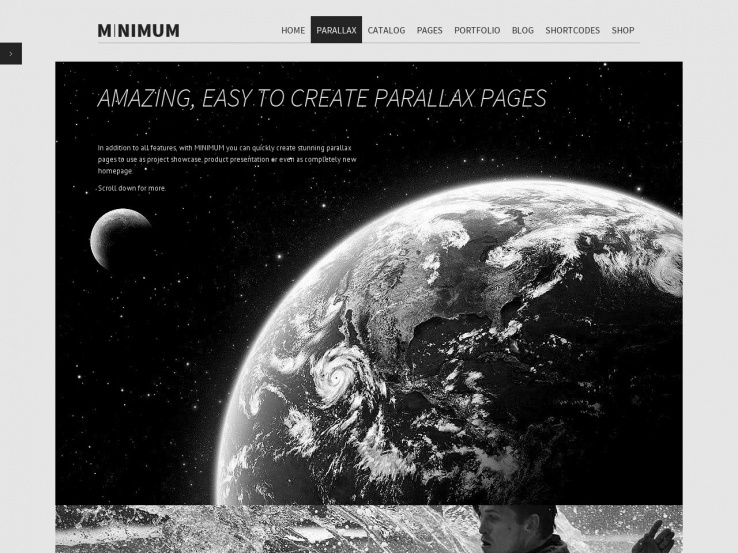 MINIMUM is a multi-layout business WordPress theme that offers a unique take on a parallax site as one of your layout options. You also get a bundled version of the Revolution Slider and an unlimited ability to include sliders and parallax on your pages. 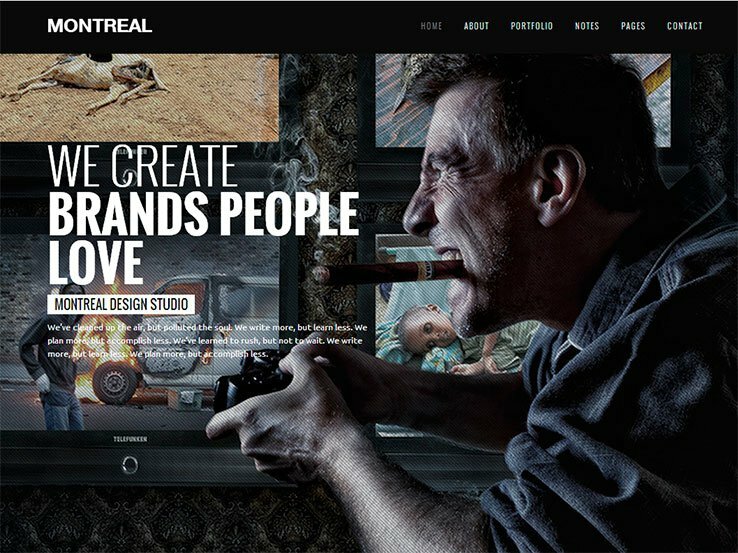 Montreal is a high-impact, typography-rich, WordPress theme with a full-screen background parallax effect. 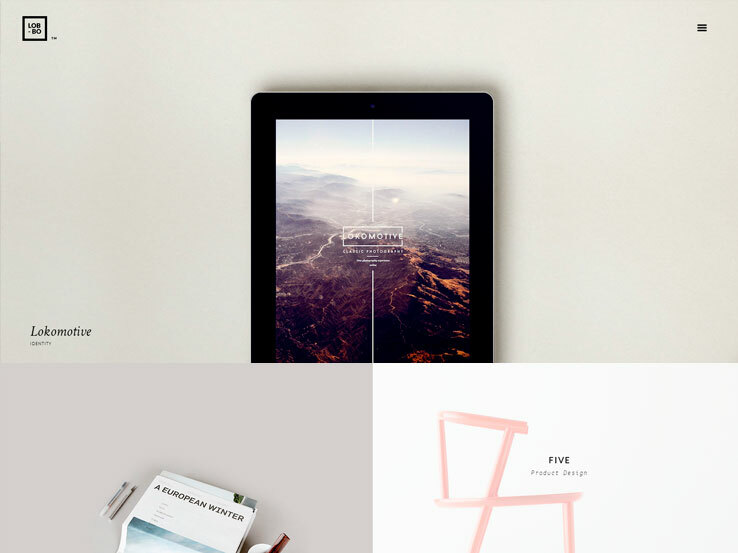 Look for a six portfolio versions, full-screen slideshow, a modern blog layout, a project planner, and contact form. 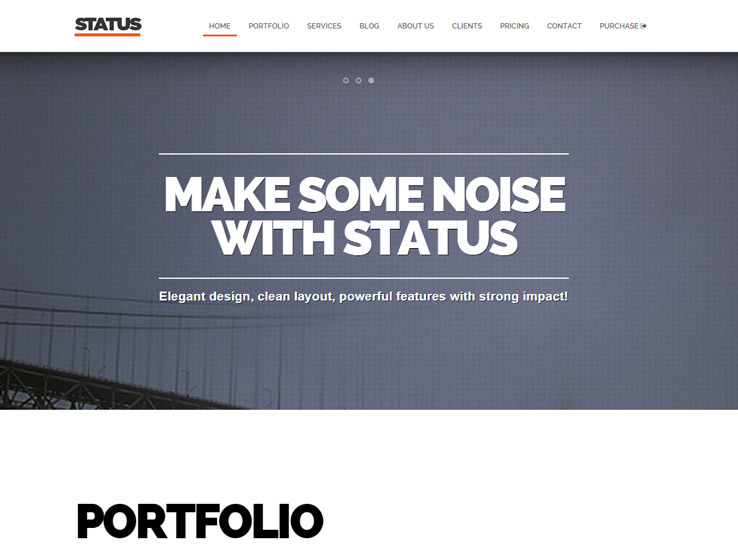 Status is a clean, modular theme with a great array of features like an advanced theme admin panel, responsive layout, unlimited color and font selection, and custom post types and is video ready. 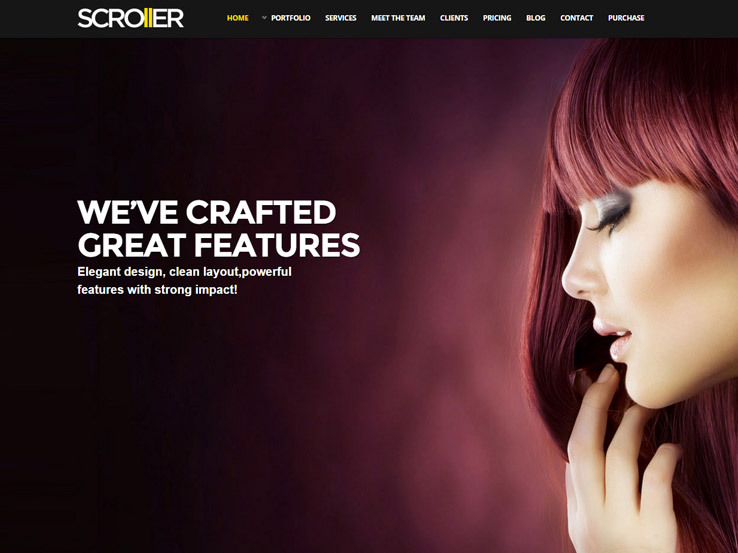 Scroller offers a full-screen slideshow combined with a modular, row-based layout to produce a WordPress theme well suited for creatives, photographers, businesses, or products. 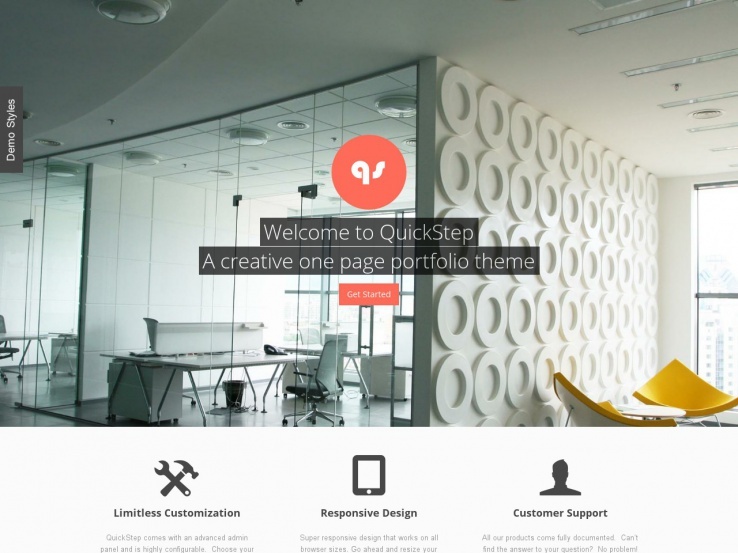 QuickStep is a clean, fully-responsive, business theme with an extensive admin panel, allowing you to choose fonts, colors, and many additional settings. 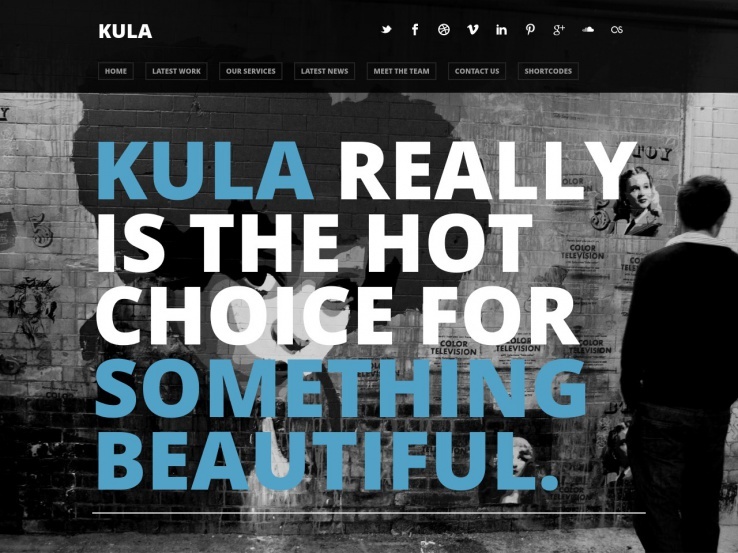 KULA is a visually stunning, typography-rich WordPress theme that would be a great fit for creatives, agencies, or anyone looking for a very modern, hip website. The author stresses the Retina compatibility so look for a great experience on the iPhone and other high-res devices. 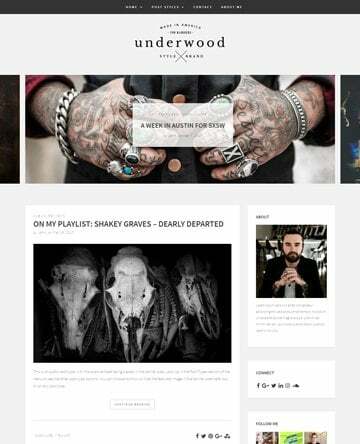 Lobo is a modular, modern, responsive theme that would work well for creatives in the web world. It offers Retina support and an extensive theme options panel. Also look for a modern use of responsive-friendly side menus and an interesting tiled layout. 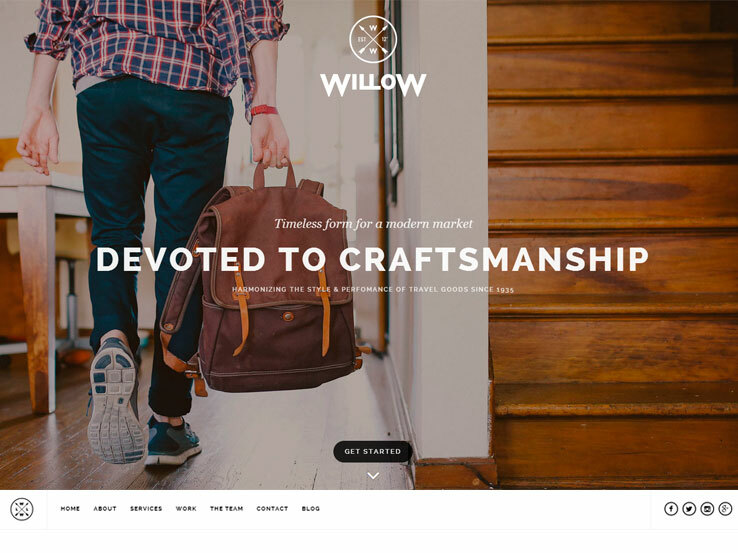 Willow is a fantastic parallax theme with many layers of motion. Look for a wide range of options and ways to modify the look and feel of this great template. Oxygen includes parallax backgrounds, nine premium plugins, full-screen image layouts, a built-in icon library, five custom full-screen sliders and two premium slider plugins, and over 25 custom sections to build your page with. Also, it comes with a drag-and-drop page builder and one-click demo install. Jarvis is a fullscreen parallax theme, with over 14 unique homepage variations. 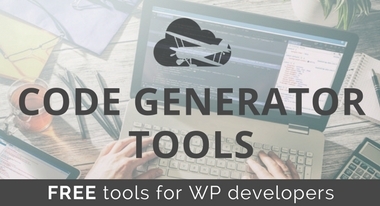 It supports the following plugins and integration: WPML, WooCommerce, WPMU, Contact Form 7, MailChimp, RTL, and Revolution Slider. This multi-layer parallax theme has smooth scrolling, complete parallax control over directions, speed, position, and more. It also includes a portfolio and gallery options, including Masonry-styles. Parasponsive is Retina-ready, includes the Parallax Layer Slider, Isotope portfolio, and a powerful admin panel. 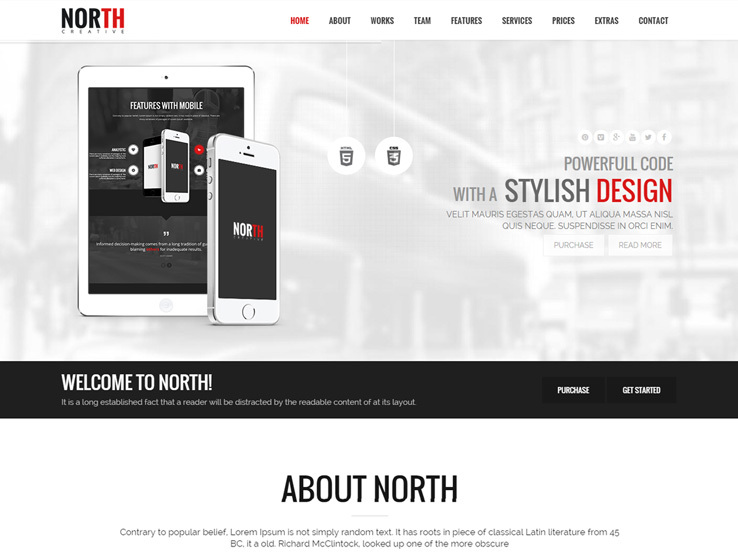 North theme features a unique one-page design, unlimited colors and layouts, powerful theme options, light, dark and night skins, and an awesome page builder. It also includes 14 different homepage layouts! Nonus is a great flat-style theme with modern layouts, parallax effects, Nivo and FlexSlider, full-width and boxed layouts, and one-page or multiple page layout options. Nice article Evan and I am completely agree that designers have adopted a variety of parallax effects to bring motion and depth to designs, list you provided is very helpful in getting some inspiration on how to use parallax for good effect. Great stuff. I Like your site Share after the image on the top can to please name the plugin ? Hi Beypin, \n\nI’m glad you like it. The social share buttons on the Nimbus Magazine are custom and not from a plugin but they are very similar to ones on several of our themes. Hello Evan! Thank you for including Zerif Pro and RokoPhoto into your article. Also, you could have a look at another theme our ours, called Parallax One: https://themeisle.com/themes/parallax-one/. We are happy to share your themes with our readers. You produce quality themes over there, and that being said Parallax One is another example of that.